POCO emerged in 1968 from the ashes of the Buffalo Springfield as a country-rock hybrid. 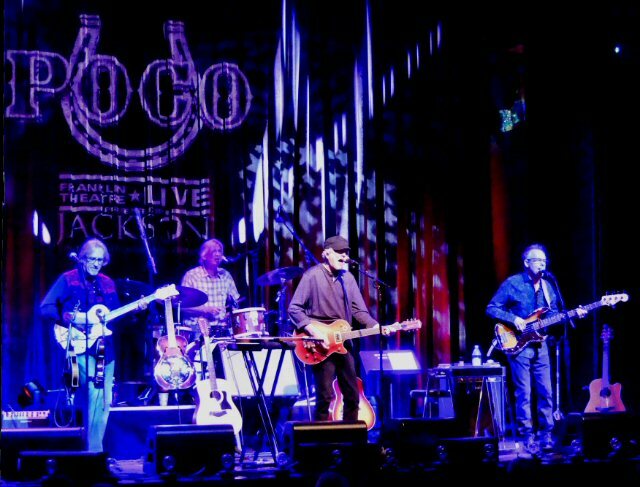 Initially, they were to be called Pogo and that name might have been more appropriate as now five decades on they have had to continually bounce back again and again from adversity to become the beloved band who took the stage at the Franklin Theater on Friday, March 22, 2019 in Williamson County, Tennessee. POCO takes the stage at Williamson County's Franklin Theater. It is fitting that POCO's logos are horses and their shoes as founding member Rusty Young has had to get back on that bucking animal countless times. In the case of some of the group's former members that symbol has foreshadowed fortuitous luck in their careers. Consider the fact that the talented guitarist/singer/songwriter Jim Messina left POCO back in their early days to form a successful duo with Kenny Loggins. POCO legendarily lost not one but two of their iconic bass players to the Eagles (lucky breaks for Randy Meisner & Timothy B Schmit). In 1978, the band was on the verge of being dropped by their label when Paul Cotton (guitars, songwriter & vocals) with Rusty finally delivered their hit-filled album that fans along with record company execs were pining for in the form of Legend. Later, during a 1989 reunion of the original lineup for the Legacy album and tour frontman Richie Furay decided that this high-profile gig really wasn't a fit and bailed with several arena dates still on the calendar. Stepping in was talented heartland musician Jack Sundrud who is currently the second longest standing member in the quality quartet. The band was bucked again in 2004 when founder and singing drummer George Grantham suffered a debilitating stroke while onstage during a critically acclaimed comeback at the turn of the millennium. POCO found another stickman to carry on while their missing man sought rehabilitation. The steady cantor through all of POCO's travels has been multi-instrumentalist Rusty Young. "Great to be here," greeted Rusty from the Franklin Theater stage as they opened with the up-tempo "All Fired Up" flowing into the peppy "Pickin' Up The Pieces". Young then introduced drummer Rick Lonow (Flying Burrito Brothers). Although a relatively new member to POCO Rick has a history with Rusty that included a co-write on "Call It Love" the next solid number of the night. Lex Browning the other new kid on the block added extra elements to POCO's sound with fiddle, guitars and mandolin. With another nod to their lengthy history of changes, POCO performed the popular "Indian Summer" which was penned by Paul Cotton. Jack handled lead vocals on this crowd pleasing piece. POCO: Lex Browning, Rusty Young, Jack Sundrud and Rick Lonow. "I told you it's going to be a special evening," declared Rusty who shared how he met Jim Messina, a newly minted Franklin resident, back in 1968. 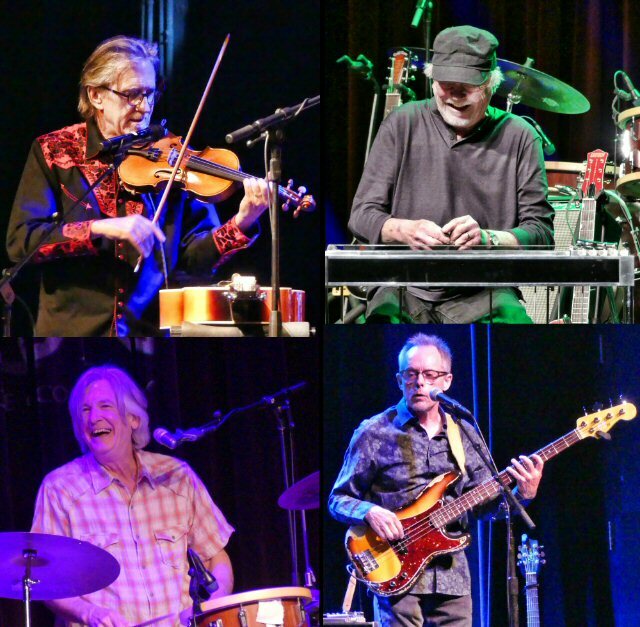 Jim joined his former bandmates for a cover of Buffalo Springfield's "Kind Woman" and then the next special guest George Grantham came out and played drums so that three fifths of the original POCO lineup was on stage. George's triumphant appearance thrilled the packed house of Poconuts. After a short break, Young armed with an acoustic shared the inspiration behind the song "Listen To Your Heart" which was written for his wife Mary who was concerned about a local dilapidated dog pound which they were collecting donations for at the show. 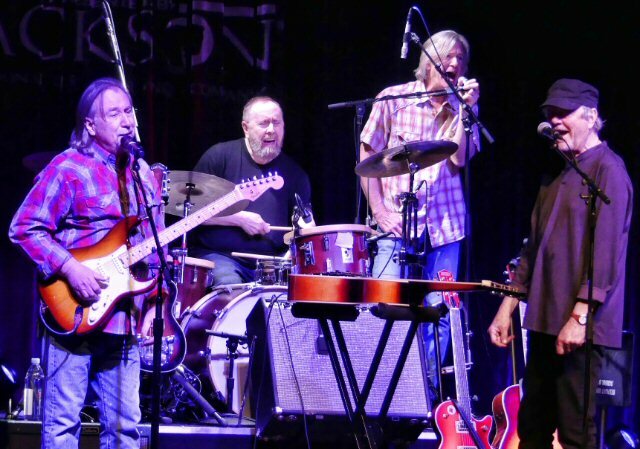 The band joined Rusty for the witty "Neil Young Is Not My Brother" and then another tip of the hat to Mr. Cotton with "Heart of the Night" from the Legend album. "Rose of Cimarron" was another classic featuring the fine harmonies and instrumentation that the group is so well-known for. A bit later, fans were encouraged to clap and sing along to "Crazy Love". "One of the most popular POCO songs," said Rusty as a lead into "Hard Country" that was first a Sundrud solo composition before being recorded for their latest record. The tune remains a powerful portrait about the struggles of farming starting with a seed of musical softness before growing into a rocking outro. With thanks to the fans they closed with "A Good Feelin To Know" and the positive encore "Keep on Trying" which aptly summarized POCO's legacy of perseverance and carrying on in the challenging music industry. "We don't feel like a 50-year old band," Mr. Young says with pride. "POCO has never slowed down or stopped making new music. Everyone loves the challenge of being in POCO, and we're all working hard at moving the band towards new audiences. We love playing for people who haven't heard POCO in a while - or are maybe hearing them for the first time - and having them discover who POCO is today." The Franklin Theater is located in the heart of historic downtown Franklin. The venue continues to support arts in the community with a wide range of programs and performances from legends such as POCO. Their upcoming calendar includes John Schneider, a Haydn Festival, Riders In The Sky, The Doyle & Debbie Show, The Malpass Brothers and Robert Earl Kean. Three fifths of the original POCO line-up appeared together in Franklin.